According to a survey commissioned by Redfin, around 35% of real estate buyers purchased a property sight-unseen last year. These buyers often purchase at the higher end of the market, in competitive real estate markets such as Los Angeles, San Diego, and San Francisco. Sight-unseen purchases are also common among investors who want to rent out the homes or take advantage of foreclosures/derelict properties to develop the land. The Redfin research found that millennial homebuyers are more likely to buy a home sight-unseen as compared to older buyers. This is likely because millennials have grown up with the Internet — they are more comfortable with making big purchases online without seeing the physical product. With no end in sight for California housing shortages, more and more buyers are likely to purchase in this way. Buying a property sight-unseen obviously brings a higher degree of risk and certain complexities. Do you have the correct procedures in place to manage your own risk as the seller’s agent? If not, an unhappy buyer may make a case after settlement that the property was misrepresented by the agent. Unless you have adequate safeguards in place to protect yourself and your business, you could be facing a lawsuit. When purchasing a property without actually seeing it, buyers may be faced with some unwanted surprises, particularly if they plan on living in it. Pests, traffic noise, nearby trains, bad neighbors, and distance to amenities are common complaints. Because real estate photographs are generally designed to show a property’s best features, maintenance issues and major infrastructure problems can also be found post-purchase. Flaws are very difficult to detect without sufficient in-person inspections prior to purchasing. There are times when buyers will have no option other than to buy sight-unseen. Interstate and foreign buyers often have no time to arrange travel to inspect the property before it sells, especially in a competitive real estate market like California. As a seller’s agent, you can put protocols in place for dealing with these buyers to reduce the buyer’s risk and your own. Advances in technology have made this process much easier. Using tools like FaceTime to do a live walkthrough of the home or using self-guided virtual tours can help a buyer learn more about the home without physically seeing it. Recommend that buyers have a trusted friend or family member inspect the home before placing an offer. This reduces the risk placed on you as the agent in relaying the property features and details of the home. You may also provide links to buyers for neighborhood or statistical information. To protect yourself and reduce the chances of a lawsuit, provide links to external sources like census data offices or the Department of US Data and Statistics. That’s safer than providing information yourself. Remind remote buyers in writing that they should also obtain information about the property via an independent building inspection. (See our sample home inspection disclosure.) Building inspections cover property issues in detail, looking beyond the surface level aesthetics. If the buyer chooses to overlook this due diligence, be sure to document that in writing. You want to be sure to protect yourself against lawsuits if something bad is found post-purchase. Including a contingency period in the contract is also a great strategy. The contingency period allows the buyer to inspect the home after making the offer, usually within a specified time period of around a week. The buyer can negotiate based on repairs needed or even cancel the contract if they don’t wish to proceed. Sellers don’t have to agree to any contingency provisions in the contract. If they do, they may be able to charge a premium for the option because of the increased risk of a non-sale. However, as an agent, contingency clauses can help you be sure you’re not facing a lawsuit because of an unhappy buyer post-purchase. To make sure your business is protected from lawsuits from remote buyers, it’s important to have adequate insurance. Take a proactive approach — check what your insurance will cover. 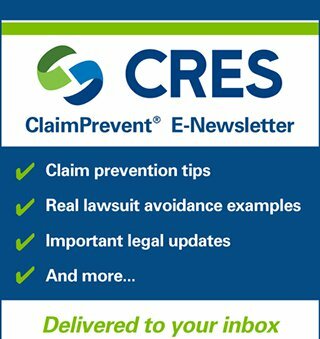 CRES real estate E&O + ClaimPrevent® includes a Legal Advisory Service available 7 days a week. If you have any questions about contracts, disclosures or waivers when dealing with a remote buyer, we have the answers. Contact CRES today on our toll-free number 800.880.2747 to find out more about our coverage. What strategies do you use when dealing with an interstate or international buyer?